The history of baseball equipment—just like the game itself—beats a meandering path, full of eccentric characters and bizarre details. That's because so many details of the game—from gloves to bats—were left up to the design of the players themselves. Major league salaries might hover above $3 million today, but for a century, professional baseball was a zero-sum game—literally. As the game got faster and more dangerous, players were forced apply their professional skills—as sail-makers, cobblers and saddler-makers—to making better equipment. What resulted was a cottage industry where players depended on their own technical know-how. The official Spalding League ball? It was based on the game balls the champion pitcher Albert Spalding would make for himself. The first Louisville Slugger? A collaboration between a powerful batter and a cabinet-maker. A catcher worked with a saddle-maker to design a hand-protecting glover. Though the road was paved with plenty of missteps (see: scythe bats), many players went on to patent their ideas or found businesses on them. So baseball isn't just "quintessentially American" because of hotdogs and fireworks—it's bound up with the emergence of America's entrepreneurial spirit, as corny as that sounds. Inspired by the Smithsonian's excellent history, we dug into Google's Patent Archive and took a look. For the first few decades after baseball emerged in the 1840s, it was considered “unmanly” if you wore a glove while playing, so players did without, catching balls with their bare hands like complete wackos. The resulting injuries were horrific and constant—but players were willing to suffer for fashion until, finally, a few ridiculed loners began to seek protection. Assorted glove patents of the 19th century. In the fateful year of 1857, a forward-thinking St. Louis Brown Stockings fielder named Charles Waite decided to spare his palms with a “flesh-colored” fingerless glove. Waite was totally embarrassed of the hideous thing (which explains the color), and he was mocked mercilessly by his fellow players. I asked Waite about his glove. He confessed that he was a bit ashamed to wear it, but had it on to save his hand. He also admitted that he had chosen a color as inconspicuous as possible, because he didn't care to attract attention... It was not until 1877 that I overcame my scruples against joining the 'kid-glove aristocracy' by donning a glove. When I did at last decide to do so, I did not select a flesh-colored glove, but got a black one, and cut out as much of the back as possible to let the air in. Happily, in my case, the presence of a glove did not call out the ridicule that had greeted Waite. I had been playing so long and had become so well known that the innovation seemed rather to evoke sympathy than hilarity. 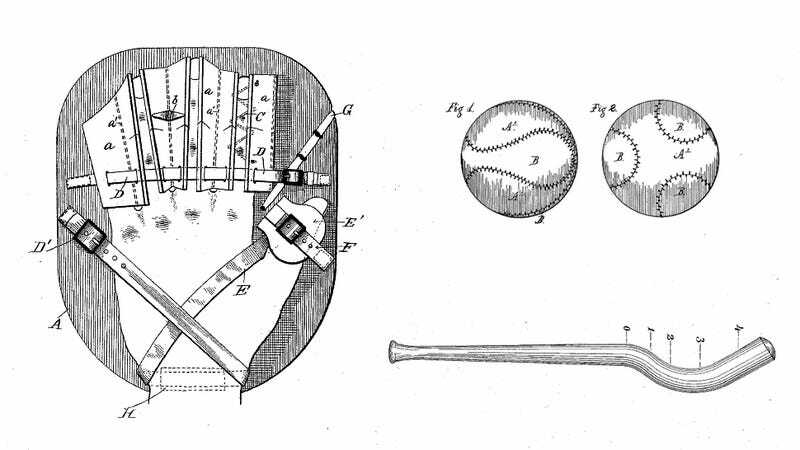 The first patent for baseball gloves, based on Spalding's design. Doak's revolutionary webbed glove, patented in 1922. This was huge: it let players use their gloves as a kind of net that could ‘scoop’ the ball from the field. Doak’s little triangle of leather birthed modern fielding—and though things have been tweaked since, contemporary gloves aren’t terribly different than those from the 1920s. Henry Denkert's 1956 patent for a glove with a pre-formed pocket. In the beginning, the baseball was a nebulous thing, a ball of wool or wood wrapped in leather that was either very fragile or wildly expensive. They were always made by hand—usually by the pitcher—and most balls only lasted for one game, falling apart over the course of the early innings until they were almost impossible to use. Assorted patents, most dating back to the 19th century. In 1857, a meeting of three teams produced the first standard baseball size, though most teams still made their own balls, often at great expense. In fact, during the 1910s, an average ball cost around $83 in 2012 money to produce (according to historians, some teams would even hire security guard to retrieve them from the stands). A.G. Spalding makes an appearance in this story, too. You see, Spalding wasn't just a glove trendsetter—he was also a brilliant ball-maker. Like most pitchers of the day, he made his own, and won a startling number of games pitching the balls, which were tightly sewn and hard enough to take the abuse of repeated use. In 1878, the National League adopted his ball as the standard, and his 108-stitch Spalding League Ball remained the official choice until the 1970s. Surprisingly, one of the few constants in baseball has been the bats. In the beginning, there wasn't much rhyme or reason to the designs—players were responsible for making (or obtaining) their own bats, and there were zero restrictions on size. So as a result, early bats were often extremely heavy and long—according to the Smithsonian, the thinking went that a heavier bat meant more power. Some had faceted faces, and others had no cuff at the bottom. Others were so bulky, it was like batting with a 2x4. Finally, in 1859, restrictions about bat size were put in place, and the modern bat started to emerge. Apart from a few hilarious diversions (at one point, even a scythe-like bat was proposed, thought to improve the spin and height of the ball) there was one event that cauterized the baseball bat: the chance meeting in Louisville between a player named Pete Browning and a 17-year-old woodworker named Bud Hillerich. The story goes that Hillerich approached Browning after watching him break his bat. The duo went back to Hillerich's shop and worked through the night crafting an ash bat, based on Browning's ideas. Though most metal bats dented easily and ended up hurting players (aluminum bats wouldn't make a real professional mark until the 1970s, when Easton began selling them). These days, a new composite material called BBCOR—a Kevlar and carbon fiber composite—is sweeping the field, introducing new complications to how the league standardizes bat technology. It's interesting that the bat—the centerpiece of the game!—hasn't changed nearly as much as the ball or the glove. In the end, it's a bit sad that baseball's DIY culture dwindled. Just imagine how much more fun tonight's All Star game would be if Matt Harvey had to stitch his own ball before the opening pitch. There's plenty of history left out of this post, so please leave your images and comments below.